It is a south Indian meal which is very time consuming to make. 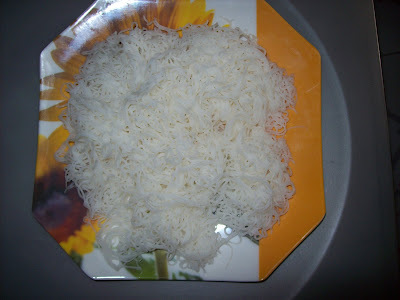 But it is very tasty Sevai can be made in 2 ways. 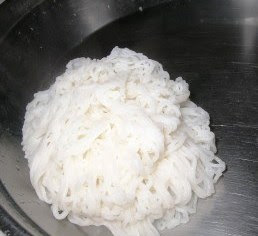 The difficult way is by first principles and the easy way is by using Chinese thin rice noodles. 1. Soak the rice in water for 8 hours or overnight. 2. Grind to a very smooth, thick batter (like idli batter) using only as much water as necessary finely adding the salt... Stir in the salt and the batter. 3 Heat a pan Add 2 tsp oil (this makes sevai tasty and non sticky) and stir the dough till it becomes thick and sticky. 4. When the dough is not too hot, wet your hands with water and make big balls and keep. 5. Boil water in another pan. After the water boils, put the rice balls in it and let it cook. 6 .When the balls float to the top, check to see if they are cooked properly. 7. You can do this by cutting into half and seeing if they are not sticky. 8. Put each ball on the sevai nazhi(sevai traditional press) and sevai comes out. 2. Grind to a very smooth, thick batter (like idli batter) using only as much water as necessary. Stir in the salt and oil once the batter is ready. 3. Grease some idli plates and pour the batter in each depression. Steam in a pressure cooker, without using the weight, for 10 minutes. 5. . Scrape the "idly" into the hollow cylinder of the sevai press. The pressure forces the noodles out of the tiny holes in the hollow cylinder. Use up the remaining dough in the same manner. 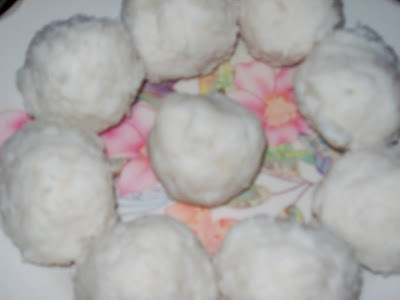 I make several varieties of sevai - coconut, lime, tamarind, sweet with jaggery. My favorite however, is Plain sevai. 1. Pour oil in a pan and add the mustard. Once they splutter add urad dal, channa dal, green chillies and curry leaves. 2. Add the turmeric powder and asafoetida mix well and remove from the flame. 4. Add salt, lemon juice and cilantro and mix till all are incorporated. 5. Garnish with roasted cashews.